Butterflies are incredible creatures that are in thousands of different shapes, sizes and colours... such variation - some wander for thousands and thousands of kms, others stay close to home, some live such short lives. All are extroardinary and beautiful. The above photo is a closeup my art journal page covered in beautiful flying creatures made from Tim Holtz Stamps, Framelits, Bigz Die and Embossing Folder. The theme was "Exotic" and is part of the Australian Art Journal Swap (click here to visit the AAJS blog). 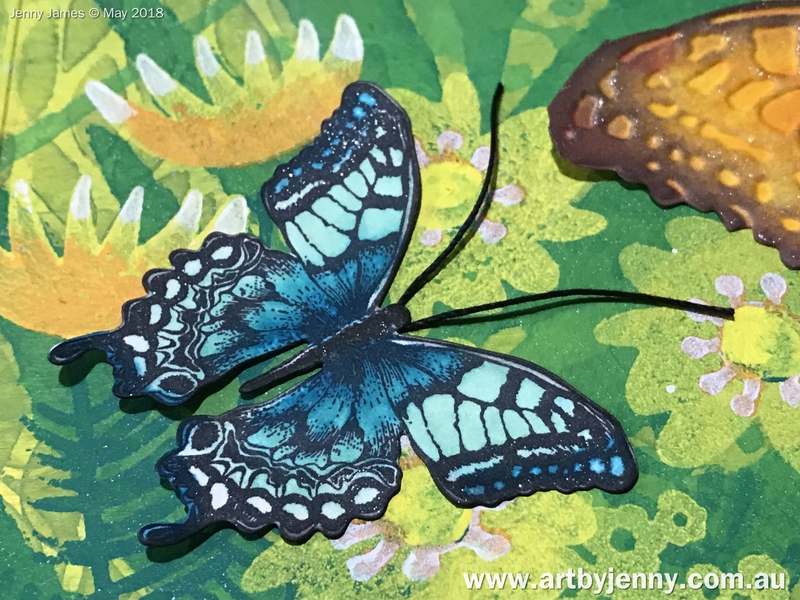 I've also used Dylusions paints, Jane Davenport Mermaid Markers and Tim Holtz Foam Stamps to create a magical garden for these exotic beauties. The background was created layer upon layer, using acrylic paints with stencils and foam stamps. The first layer (above) was simply Lemon Zest and Dirty Martini, smooshed all over the page then left to dry as I sifted through my stencils. 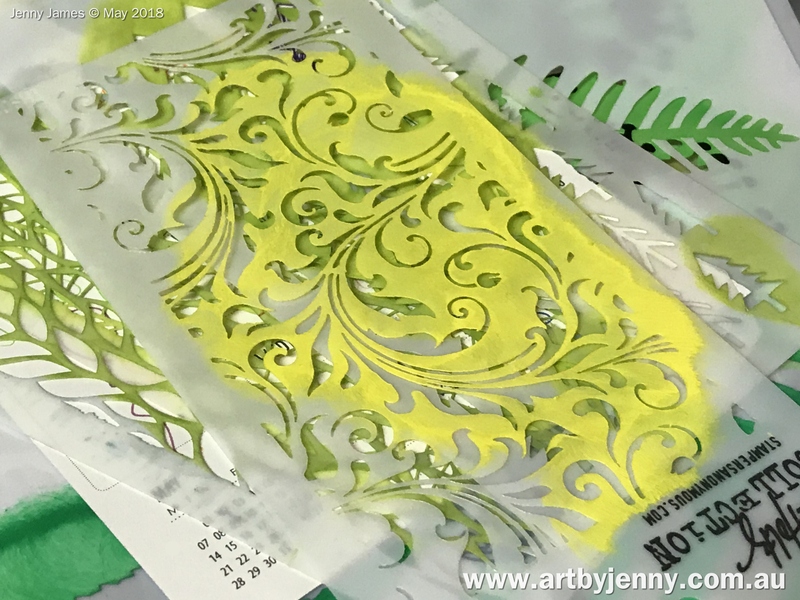 Using the foam blending tool, I blended the Tim Holtz Leafy and Feather stencils using just the Dirty Martini paint. 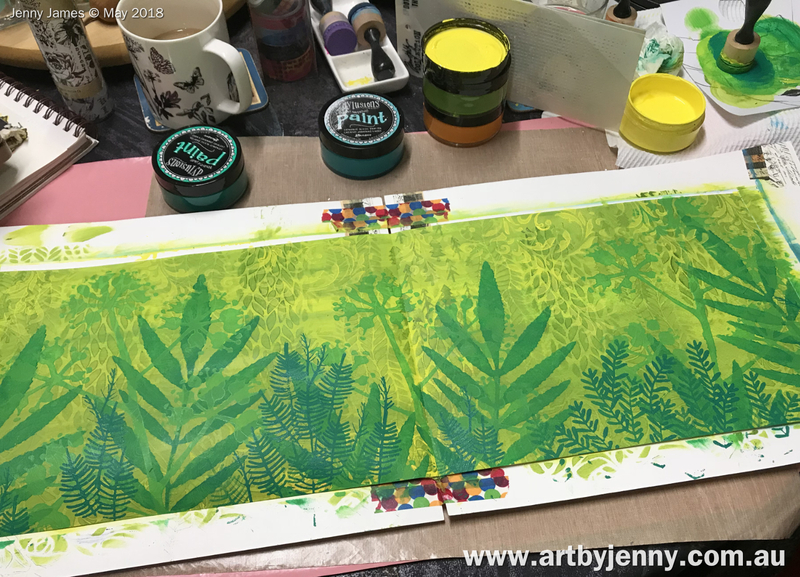 This pic of my paint covered stencils is just to show you what the stencils look like :) Thought it might be useful considering I don't seem to have any action photos showing them in use! For the next layer, I've used the large Darkroom Door Fern and Blossom stencils and then the Tim Holtz Pines, Scribbles and Flourish stencils with Polished Jade (the darker green), Dirty Martini and Lemon Zest. The Blossom was blended with a mix of Polished Jade and Lemon Zest. 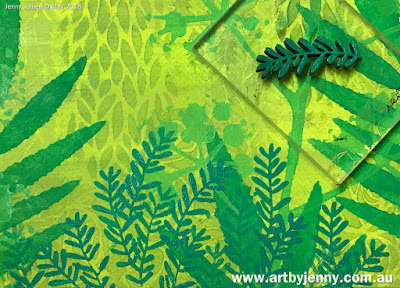 Using the Vibrant Turquoise paint and Cut Out (Funky) Floral Foam Stamps by Tim, I printed the foreground foliage. The above shows the background before I added all the flowers. 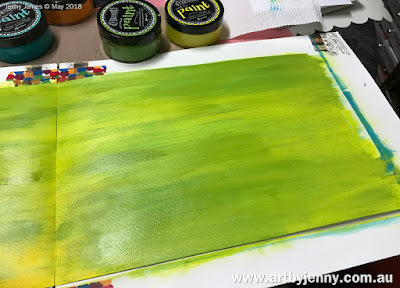 I was on a roll, mixing the greens, blending the yellows, "growing" the garden! So much that my coffee went cold... as it often does :) lol Gotta love my mug though! My son gave it to me :D Its beautiful. Above: As you can see, I add the paint to the foam stamp using the foam ink blending tool, collecting paint from the lid. This gives the foam stamp an even coverage of paint. If you dip into the paint you may get lumps of paint where you don't want them! When leaving your pot (or jar) of paint open for a while, make sure you add a spray of water before closing again - this will ensure your paint stays beautifully fluid to the last drop. To paint the flowers I used Lemon Zest and Pure Sunshine... the fab thing about foam stamps (apart from their cool shapes and not having to cut apart potatoes!) is that you can see exactly where to overlay the image when printing with multiple colours. 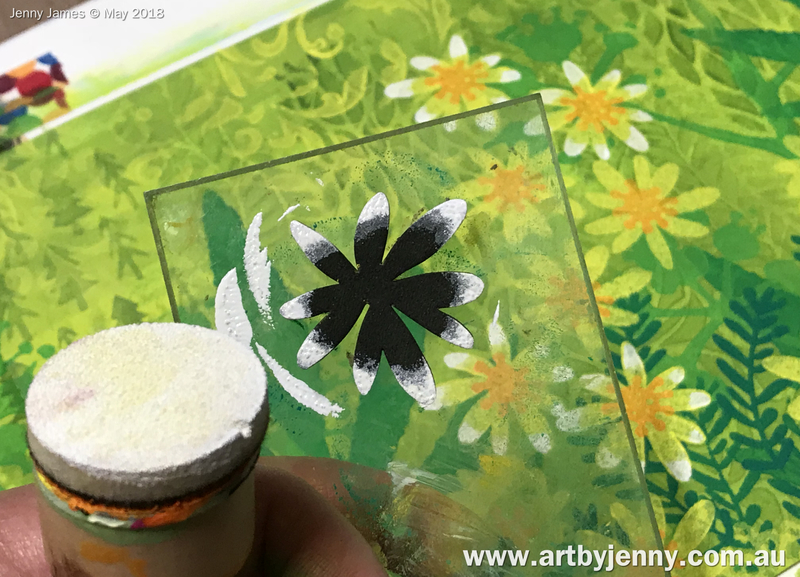 To add white tips to the petals, simply add paint only to the tips of the petals on the foam stamp then press over the flower on the page. Above: photo showing the finished garden on the right hand side of the journal page. Above: photo showing the finished garden on the left hand side of the journal page. 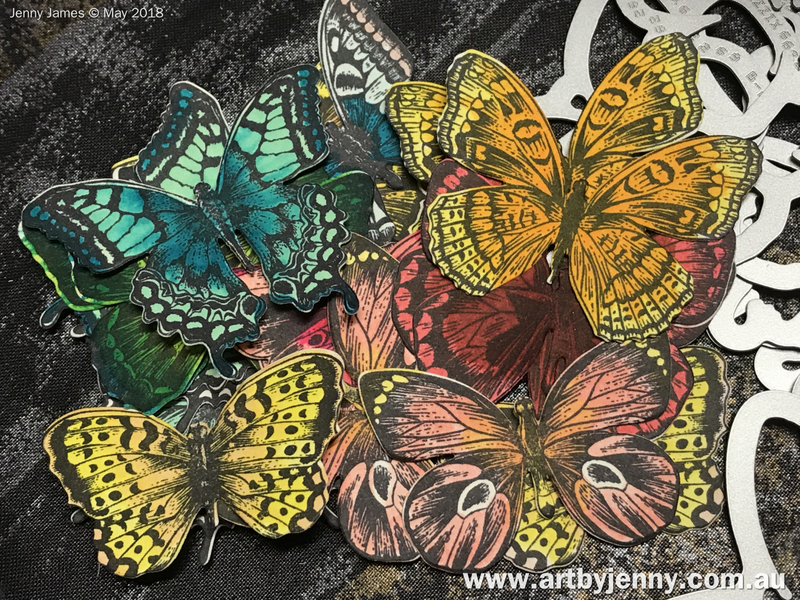 The two giant butterflies were coloured using Jane's Mermaid Markers (Pirate's Gold with Starfish; Lagoon with Bali Blue and Byron Bay) and left them to blend naturally as they dried. 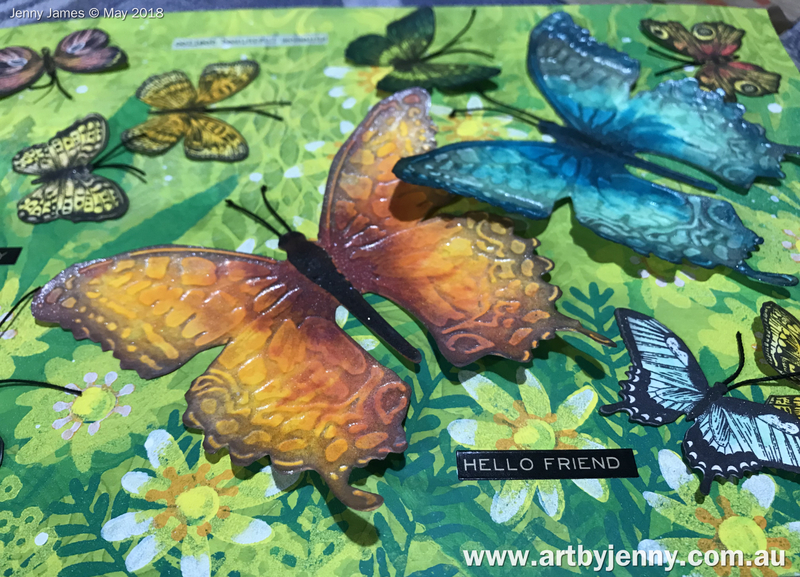 They were both cut out with the Tim Holtz Butterfly Duo Bigz Die using my Cuttlebug. Then they were rolled through again using the matching texture fades embossing folder to give them the raised pattern. A splash of contrast was added using Black Soot Distress Ink and an ink blending tool. The abdomen was coloured with the dark brown Reef Mermaid Marker. The butterflies were given a splash of shimmer using Winsor & Newton Iridescent Medium. All butterflies need antennae to feel their way and chat together... sadly the Bigz die cuts them off but they're easier enough to add back. Sometimes I'll use twine or string but this time I've used Tim's cotton thread and bit of double sided tape. As you can see above, I use one piece of cotton and bend it under the tape. 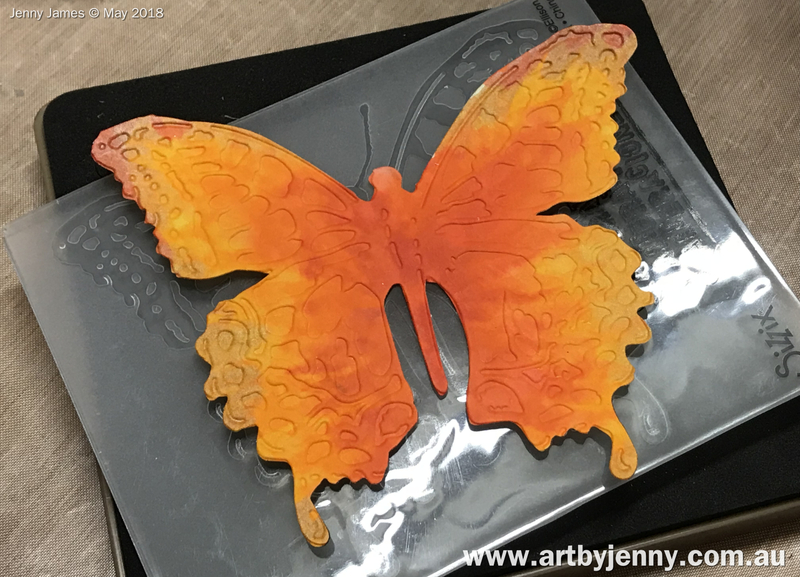 All the small butterflies were created using Tim's Flutter By stamps and matching Sizzix Framelits. To make them, I stamped them all using an Archival black ink pad. I was going to use colourful inks, but our encyclopaedia shows nearly all butterflies have either black, white or brown outlines. One by one, their antennae was added back (after being cleanly cut off using the Sidekick and Framelits) using the thick cotton thread and double sided tape. One day Sizzix will make dies for butterflies and dragonflies with all their anatomy in tact. 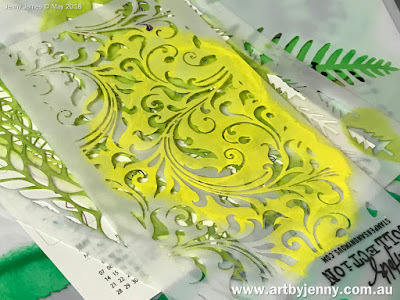 Maybe even embossing and cutting at the same time. Have you seen the Impresslits yet? Very clever! A quick closeup of all the butterflies waiting together for the next step. After adding antennae, inking all the edges and painting the bodies, I added a splash of shimmer using Wink of Stella... black for the bodies and clear for the wings. Closeup pic of one of my faves... who am I kidding, all the butterflies are my faves. Even the red ones after I added white spots and more glittery shimmery stuff. Placing elements on a page to make it appear like it was random isn't as easy as it seems... I started by letting them fall wherever they wanted but it was a tad lopsided. In the end, after about an hour! 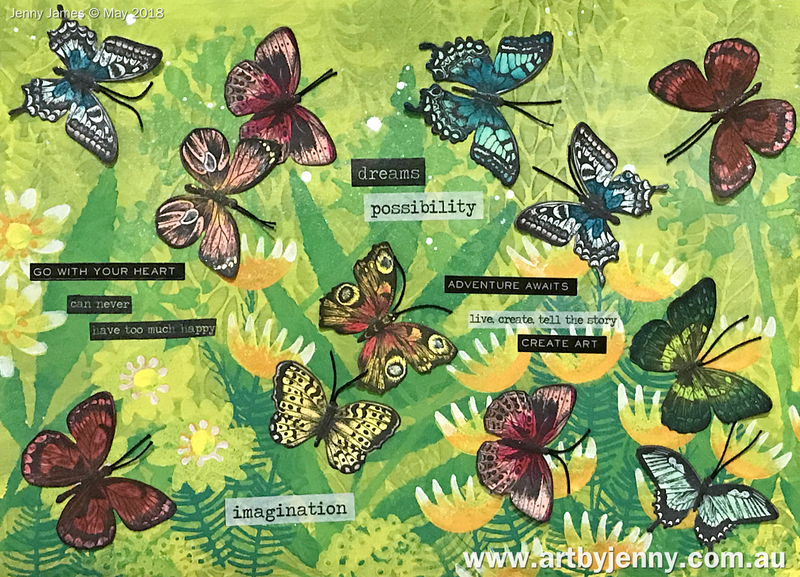 lol, I placed the big butterflies on the right hand side - flying into the page together, while the little ones flew around them. All butterflies were glued down with the double sided tape. I didn't add more, I used the same piece that held on the antennae, allowing all their wings to be free to fly. I then added thoughtful words and sayings like 'go with your heart', 'can never have too much happy' and 'adventure awaits' using Tim's stickers and washi tape. Above shows the completed left hand side of the spread and below shows the right hand side. So there we have it. A completed flock of flutterbies and butterflies, almost as beautiful as what Mother Nature creates :) I love moths, caterpillars and dragonflies too! They're all incredible! Thanks for reading my blog :) Hope these butterflies made you smile and inspired you to paint, colour and create!